Grayson and I started a tradition about 12 years ago with our friends Kyle and Susan that revolved around the then-new TV show Survivor. We all thought it was a neat concept, and we got together to watch it every week. We watched several seasons with them, and then they moved to Atlanta. We watched a couple on our own, and then Grayson lost interest. I watched a couple more seasons by myself, but then I let it go for a few years, too. I didn't pick back up until one of the All-Star seasons or maybe the recent Heroes vs. Villains season. At any rate, now that Nathaniel and Nick are quite the outdoorsmen themselves, they are interested in the show, too, and we allow them to watch with us as long as they don't repeat any of the more "colorful language" they hear on the show. That's the deal. So, back to the tradition. It wasn't just watching the show with friends. It involved a voting system. OF COURSE IT DID. Because I have to make a game out of everything. 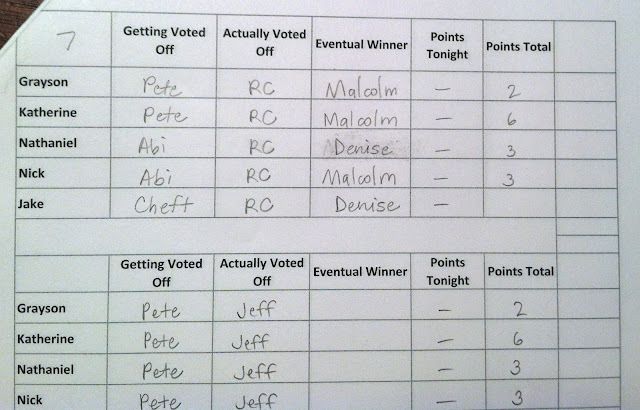 For the current season of Survivor, I resurrected the voting tally sheets that we hadn't used in years. With Kyle and Susan, the couple who ended up with the least combined points at the end of the season took the winning couple to supper at the restaurant of the winning couple's choice. With our kids, same rules, except we're playing as individuals -- and Grayson and I will pay for the meal either way. But ultimately one of the kids gets to pick, or one of the adults gets to pick the restaurant. 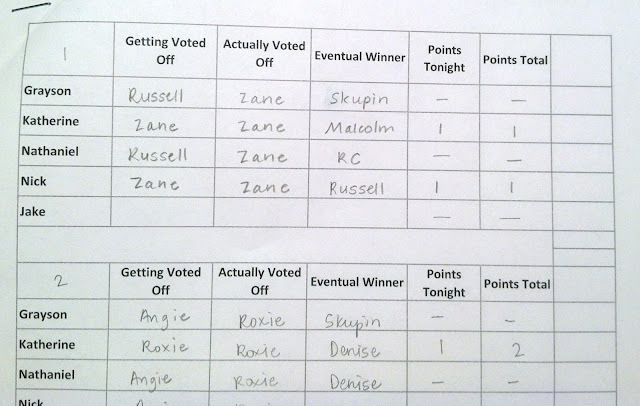 We're still an episode or two behind at the moment, but this is how it works: each week, right after the players all make their case at Tribal Council (and before the vote), we pause it and we each share who we think is getting voted off that night. Then we hit Play, and we see how it plays out. 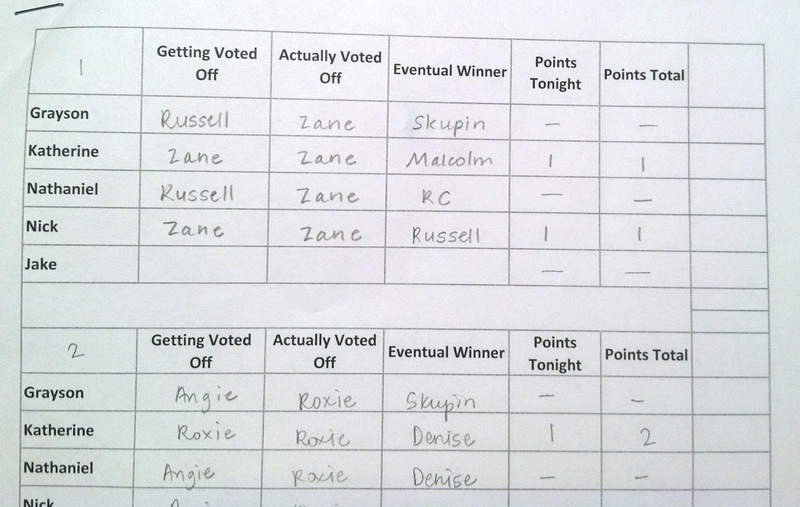 Once we've seen who got voted off, we then vote on who we think the eventual winner of the show will be. So the most points you can earn in one night is 1 point -- until Finale Night. 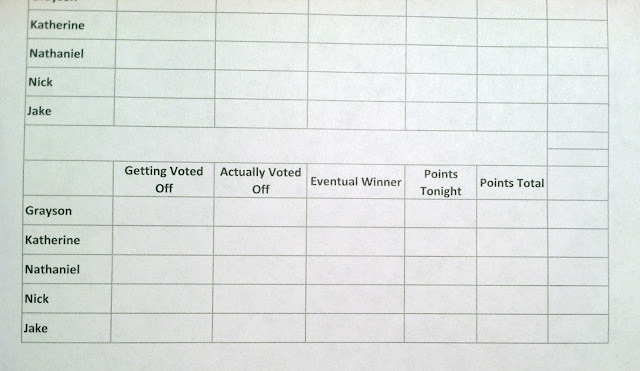 On Finale Night, when the winner is revealed, I'll go back and see who has the most votes listed in the Eventual Winner column for the person who ultimately won the game, and I'll add all of those votes to each person's total. Right now I am leading with six points. But that can change at any time. I'm pretty sure Jakey's not a threat, though -- you'll notice that two weeks ago, he voted for someone named "Cheft." And there is no contestant named anything like "Cheft" on the show. So, there's that. 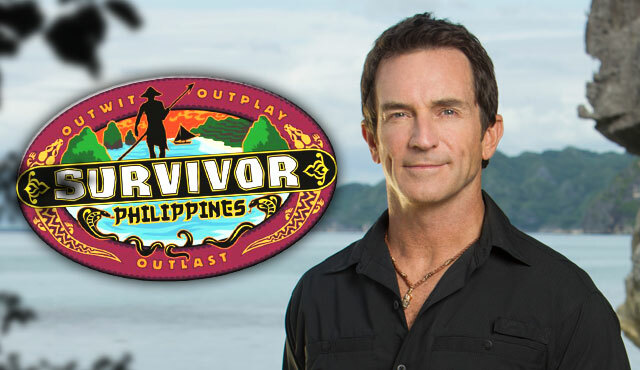 But if you watch Survivor, this is a great way to add another fun element to your night!